This fellow had a great way to combine wargaming, Christmas, and yummy food. 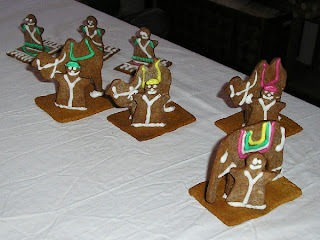 Gingerbread men fight the battle at the North Pole and all casualties are eaten! This is a photo of "The Army of the East are the Three Wise Men from eastern lands, come to put a stop to the overly drawn-out celebrations." 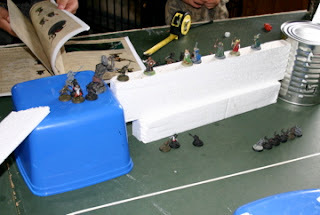 Today Eric and I played a Lord of the Rings wargame. I quickly realised that he had set the game up a little one sided. He had six heroes worth around 600 points and I had around 480 points worth of weak goblins and orcs and a few trolls. As you may be able to tell from the photo, there were a selection of tins and ice-cream containers joined by thin bridges. My forces were set up on each of the highpoints and the plan was for Eric to plough through my forces like a knife through butter. I had other plans. I retreated when it was hopeless and moved up the other forces and generally caused so much havoc that he was forced to change his plans. Only one wounded hero ended up escaping the demise of his companions. Anyway, the point of this tale isn't just how the tables were turned, but more how the wargame we played can be a useful lesson. At no point was any plan a sure fire winner. Each action could be thwarted by a series of good or bad dice rolls, so the aim is to increase the odds in your favour and have plenty of back up plans depending on circumstances. At some points I had good dice rolls, at others Eric rolled much better. The difference was I kept changing things so the odds at each encounter were more in my favour than Eric's. "In life, Eric," I said, "nothing is a sure bet. You have to accept changed circumstances and plans not coming to fruition as the normal state of being. If something actually goes according to plan be grateful. Just make sure that you have options when your circumstances change. This may involve some savings, backing up your data, or even just an extra pair of underpants in your bag." Eric nodded and added, "and be grateful for the good dice rolls." 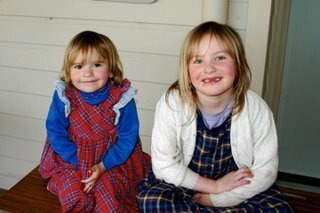 As part of our year end reflections, and in response to questions about our homeschooling style, we have finally worked out what method of homeschooling we use. Structured, Classical, Literature based unschooling. As you can gather that is quite a mix of styles which on the surface appear to contradict. However long time readers of Bruggie tales could probably have worked this out. 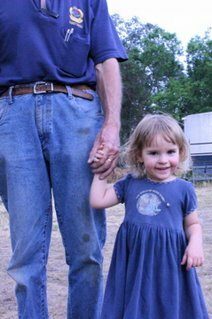 We don't strictly adhere to any of these individual TYPES of homeschooling, but instead select the parts that suit our family and each child's proclivities. Naturally we always wonder whether the children are learning or doing "enough". Having experienced Ariel's activities in the workplace over the last few months it looks as if we are on the right track. For structure we use a planner which divides up books and tasks over the 30 to 40 week school year. We primarily focus on Maths and English Literature and reading skills as a framework and fold in the rest using a combination of books and experiences for History, Social Studies, Geography, Science and so on. We also have regular Maths Quizzes to keep the children's mental maths skills active. We deliberately immerse the children and ourselves in our culture and history through literature, especially audio books. Embracing and infusing all this, in daily life and all subjects, is the faith and God's interaction with us all. Update: This must be a year end tradition. Last year we reflected on Why We Homeschool. 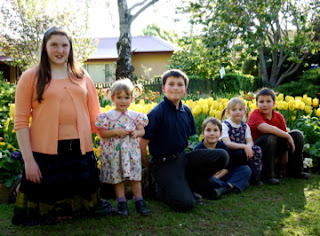 If you are interested in all our homeschooling posts, just click the label bit at the end of this post. Sometimes it pays to keep quiet about great budget savings. A very short time after posting about Budgetting, we all hopped into our van to go to Mass. It didn't start. The battery seemed to work but the starter motor just whirred unhappily. OK. No Mass today. Everyone out. Lana's Dad had a good look and worked out that the battery was really "stuffed". So we toddled off to town (45 minutes away) and obtained a new battery. The van still didn't start. This was more serious. We called a number of mobile mechanics but the ones that covered our area were all on holidays this week. So we called the place we get our van serviced and they were open. 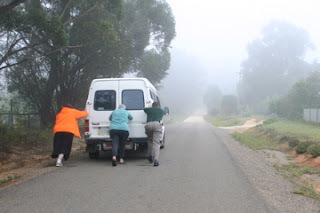 We just had to get the van there and that meant giving it a push start. Dad's little car was able to get the van up the slight slope and out of our driveway, and then Lana, her Mum and I gave the van a push start and Dad timed the ignition and the van started! A trip back to town, and we left the van at the service place with news it would cost about $1,500 ($1,125 USD) and probably be ready Tuesday. This afternoon we had the call they received the starter motor today, the van was fixed and it would ONLY be $1,295 ($970). So by year's end, my six monthly figures ended about on target after all. Did you note the fog in the photo? This is high Summer, and whereas last year New Year's day was over 40C (104F) this year it looks to be around 20C (68F) and with much loved rain. This week's Carnival of Kid's Comedy is very short. It only has one entry. Our post about Clare's future plans. Cool. A special Bruggie Tales Carnival! As most of you know I have been an accountant since I first started work as a trainee accountant back in 1982. In that time I have learnt the hard way about finance and debt and assisted many businesses and families with their accounting and financial situations. I am a big fan of simple methods of tracking income and especially expenses and have developed on my Dad's basic methods. I have been recording our financial position for some time and wanted to share what we do. We use Quickbooks as I need to invoice clients. For most personal use, such as when I was in the US, I just used Quicken. ALL our expenses, whether cash, cheque (check) or credit card are recorded in the system. I don't go in too much depth but it is really important to measure what you spend. You can't cut costs or change spending patterns if you do not know what they are. Also, tracking all expenses means I now what is due on any credit cards before the statement arrives. Online banking is a marvellous measuring tool. I stick to two broad categories of Discretionary and Regular, then subdivide into the actual expenses. This helps me to determine where I can quickly cut back if I have a change in circumstances. The last six months for us is pretty indicative as it has been a steady time and all the transition costs are over. In total we spent $22,000 AUD ($16,500 USD) for everything. That's not bad for a family of 8 people. If needed these expenses could be cut by one third pretty quickly. Remember - the first step to changing anything is finding out where you are. It is getting harder to work out a good present for Ariel. Books would only last a day or two and now she can afford her own, and Lego isn't really her thing. So we decided on something unique. In her parcel were three dress and skirt patterns. Lana, Ariel, Lana's Mum and our neighbour will go on a trip to the city where there are lots of fabric stores and go shopping for some material then they will get together and make some skirts and dresses. Here is Ariel modelling the new top she received from my Mum. Today's special Christmas delights included Pavlova and individual strawberry cheesecakes. With ice-cream and cream of course. 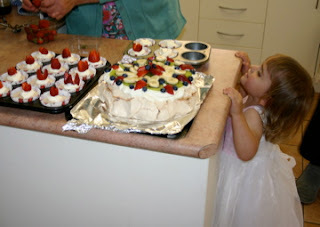 The Pavlova recipe is posted previously and here is the cheesecake recipe. Mix the melted butter and crushed biscuits/cookies and press into the tray or pan. The base can be either a Lamington tray (9" x 13") or individual muffin pans. This made 28 individual cheesecakes. Beat the cream, sugar and cream cheese together. Dissolve gelatine in half cup hot water and add to cream cheese. Let it set in the fridge. It sets fairly firm and can be sliced easily. For fullest flavour serve at room temperature. We obtained this recipe from a friend who made Mango cheesecake for a restaurant. In the photo, we are showing the individual cheesecakes decorated with a dollop of cream and sliced strawberry. Rose is just making sure all is going according to plan. There is a bonus to Midnight Mass. The children sleep in. At least a little longer. This is the Tradition at the Bruggie house on Christmas Morning. The children get up in a certain order. First one awakes and looks into the loungeroom and examines the treasures under the tree. He then sneaks back into his room and patiently waits about three seconds before waking up the next sibling who does the same. In a relatively short time they are all awake, staring at the sifted presents, wondering what to do until Mum and Dad awake. The first child then comes into our room and whispers (because you always whisper when the other person is on the phone or asleep) and asks if we are awake. "Not yet, " we reply and they exit the room, tagging the next child to enter a long time - about 30 seconds - later. Eventually we are all awake and one child is designated to go get Lana's parents who join us. Once we are all gathered around the tree, eating the compulsory Christmas chocolate or two, Ariel and Eric - being the eldest - are in charge of distributing presents. The trick here is to ensure that no more than two presents are distributed at any one time so all can appreciate the gifts the others have received. It is fun watching the children as they receive gifts they hadn't considered. Clare's eyes went really wide when she opened up the tea set Lana's parents had given the two girls and Rose had a huge grin when she received a baby doll just like Clare's from my parents. 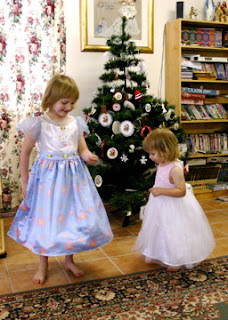 Here are the two girls testing out their new dress-up dresses. Yep. They work. They spin just fine. We would like to take this opportunity to wish all our visitors a happy and holy Christmas. We have had a great time sharing our adventures with you all and appreciate all your comments and interest over the last few years. The children were very excited last night. We had been to morning Mass (for Sunday) and now we were in the waiting time until Midnight Mass. Lana and Rose had an afternoon nap, but the other childrn were too excited (or "too old") for that type of thing. Eventually, Clare, Peter and James had a two hour sleep (at their suggestion!!!) before we had to get up at 11:15pm. The Mass was great with the priests from the Monastery in Gold vestments (as it is a great celebration) and Ariel and Eric joined the choir. I must say that the great thing about Christmas Carols is that you can sing them with any type of voice, just let fervour and volume make up for singing talent. At least, that's my theory. We had mentioned to our neighbours we were going to midnight Mass. They thought about this when they returned home and called wishing to join us. No worries, we said and their first experience of a Catholic Mass was this one with all the bells and whistles! Do you remember first attending a Catholic Mass and wondering whether to stand, sit or kneel? Lana remembers my father giving her the tip that all the posture changes help us keep awake during long Masses. So Lana faithfully passed this tip on to our neighbours. After Mass, Father mentioned that St Nicholas had dropped by on December 6 and left a number of sweet reminders for the children. This gave him an excuse to give a short history of St Nicholas. 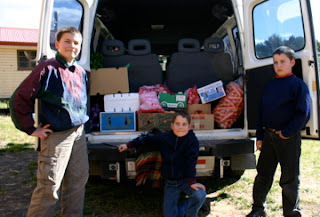 Following the joy (and lollies) shared amongst the parishioners we drove home very carefully. After the rains there were lots of kangaroos and wombats on the roadsides munching on the green grass. Nothing can ruin your day like a collision with a kangaroo or wombat. It's a bit like hitting a deer, but kangaroos can be larger and wombats have been compared to mobile speed humps. In the midst of our celebrations amidst the falling rain yesterday we received a phone call from the local Harvey Norman (Electrical Goods Outlet) in Goulburn. Goulburn is in the midst of extreme drought (as reported here) and they obviously shared our joy at the rain. The lady asked when I would be in Goulburn next. "Because you've won the bear." 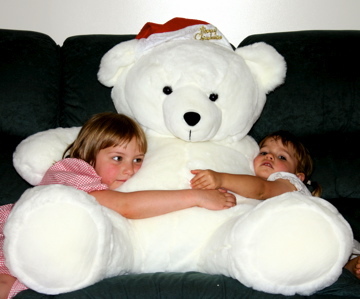 The huge white teddy bear that Clare and Rose are hugging was the prize in a competition for customers that purchased some product in the last few months. So we popped in today after Mass and received another Christmas present. The father of our neighbouring homeschooling family made an excellent point when he saw it. "Pity it's white, isn't it?" Clare (5) was sitting with Grandma and Lana discussing the news of day. "I can't wait to get married." she said. "Don't be in a hurry for that." Grandma replied. "I want you all to be there." "I'll be there if I can. You don't need to hurry." "Rose can be the flower girl." "By the time you're old enough to be married," Lana joined in, "Ariel or Eric may have a little girl the right age. Rose will be a bit older by then." Clare pondered this and added, "I think I'll have a flower man too." "Flower men are usually called page boys." Clare stopped talking for a while and pondered all this new information. Suddenly she popped up and said, "I think I'll get married after breakfast." Grandma responded holding back a big smile, "Oh yes. You don't want to get married on an empty stomach." What is your plan for the children? What are your plans for your children? Or, to ask a related question, what is your plan as parents? Both articles are an excellent start to a conversation all parents should ask themselves. How do you measure success as a parent? We reckon that if the children end up as happy, productive members of society and on their way to heaven (that is, knowing, loving and serving God) we would have done our jobs reasonably well. As Orson Scott Card discusses, aiming to be the best or just happy are dangerous aims as their attainment or the drive towards their attainment do not necessarily provide us with what we sought underneath the simple answers. An early Christmas Present - Puddles! Today we received a great early Christmas present. Rain! "Woohoo!" we yelled and sent the children outside to play. Puddles quickly grew and after a brief lull rain poured again and all of our water tanks overflowed. "Yee-haw!" Full tanks for Christmas. 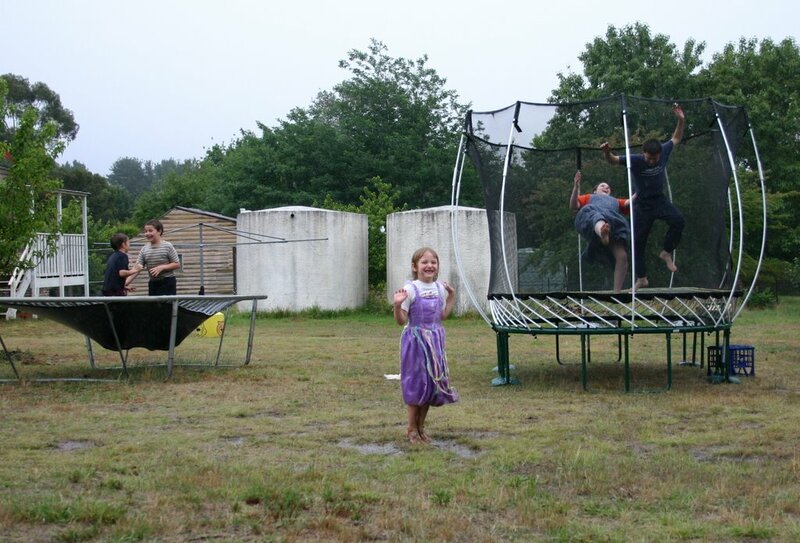 In this photo Clare is having fun jumping in one of the puddles whilst the other four are enjoying wet trampolines. It's great fun jumping onto the wet canvas with water bouncing up at the same time. (Click on the photo for a more detailed photo.) I was able to catch James and Peter just at the bottom of their jump and Ariel falling. Phew! Now I can sit down and post about the way Australia handles Christmas and the so-called "War on Christmas" that seems to be an annual event in the US. There is no war on Christmas in Australia. No-one threatens to sue anybody over a Christmas display or demand equal time for their real or imagined celebrations. When an over zealous public official or council tries to make Christmas bland or totally "Politically Correct", they are soon shouted down or encouraged to grow up. Almost every store has decorations for Christmas including trees, tinsel, various Santa Clauses, nativity scenes and banners. Local councils have street based decorations to encourage the joy of the season. 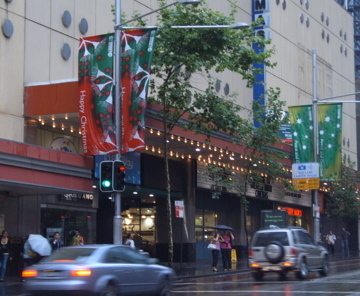 In the top photo taken in George Street, Sydney (the most central street) you can see the Sydney City Council's red and green banners proclaiming "Merry Christmas" and "Peace and Goodwill". The lower photo was taken in one of the malls I traverse from the hotel to my city based client. 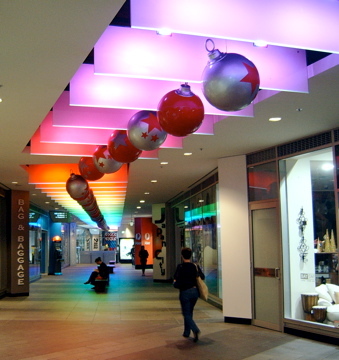 They have installed all these Christmas balls and the ceiling lights continually change colour. There is tinsel in the walkways and stores and a number of very nicely done nativity scenes in shop windows. Almost everyone you meet will leave you the passing "Merry Christmas". Even Buddhists and Muslims wish you a Merry Christmas and those that don't follow any Christian faith still plan to participate in the joy of Christmas and get together with their families. We have both Christmas day and St Stephen's day ("Boxing Day" - Dec 26th) as public holidays. 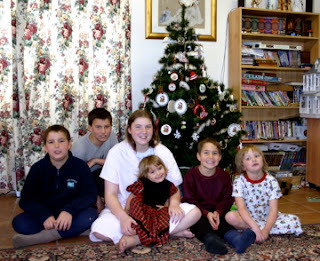 As Australians don't celebrate "Thanksgiving" as a separate holiday, Christmas is the time of gathering as a family and giving thanks for the year that is almost past. As it is the middle of Summer, everyone is in fine holiday spirit, eating plenty of food, playing backyard cricket and other enjoyable activities with the family. We give thanks that Australians are generally very tolerant of other's beliefs and there is no offense taken because one group of people is having a holiday. After all, why should I get offended or upset because Jews celebrate Hannukah at a time we don't have a celebration, or someone is enjoying a fine roast lamb on Good Friday when Catholics abstain from meat? As I am very busy at the moment and spend many nights away during the week, I try to spend as much time as possible on the weekend with the family. This takes the form of a number of activities such as shopping with a random assortment of the children, going to Mass and then perhaps visiting a park with the whole family or just mucking around at home. 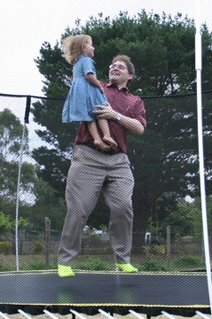 The children were excited when I tested the new trampoline on the weekend and Peter decided to take some photos of me jumping with Rose. It is all of these times that make family life very enjoyable. The children and Lana aren't just "my family", they are also my friends. Where do used Shipping Containers go? Have you ever wondered what happens to all those shipping containers that arrive here and other places around the world filled with cheap goods from China? I hadn't but it is worth considering. If our trade balance is not equal with China - that is, we send them as much as they send us - then what happens to the empty containers? No one is going to send an empty container back to the factories in China. Read this fascinating post at "Honest" Things to learn more. Update: Just take note that his previous post reveals himself as a conspiracy leaning fellow and so the idea regarding the shipping containers should be taken as an idea - not as a fact. The comments on the Vox Popoli post add a number of alternative reasons for the imbalance. Now that we are in Advent (the 4 weeks preparing for Christmas) we have created our Advent Wreath. 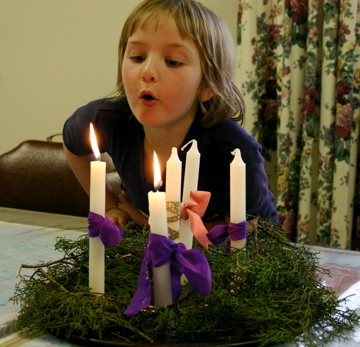 The Advent Wreath is supposed to have at least a candle for each of the four Sundays within Advent circled by some evergreen branches. Three candles are Purple and one Pink. You can also have an optional White/gold one in the middle for Christmas day itself. On the first Sunday, a Purple candle is lit. The second has two purple candles lit. The pink one joins the other two in week three and then all four are lit on the last Sunday before Christmas. Ariel made the wreath using candles, some branches from some bordering Pine trees and ribbons of the appropriate colours around the candles. In case you were wondering, the candles were set up straight but things move, donchaknow? The key to careful water usage is using it more than once. This can mean using the washing machine rinse water for the plants or catching dripping showers and taps/faucets in a bucket or two. With Dad's help we have mastered another method. 1. The younger children get dirty. 2. 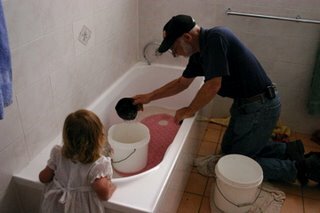 They take turns using the bath, washing the floor at the same time. 3. The extremely dirty water gets transported via buckets to give our plants a drink. As you can see Rose helps in all three steps! 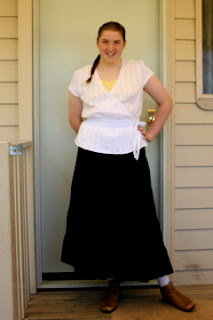 I found this at Mary Ann Bernard's blog who found it at Eclectic Homeschooler who got it from someone else. Now you've seen it too. I have Australianised some of the points and added a couple at the bottom. The bold ones certainly apply to us. 1. You went to school in your Pajamas. 2. Your biology lab consisted of assisting in your sibling’s birth. 3. Your stacks of books to check out was taller than the librarian. 4. Your PE came from chasing little toddlers around. 5. Your school bus was a 9 passenger van (12 actually). 6. You considered school work after lunch to be cruel and unusual punishment. 8. Your social life was viewed by some to be one rung lower than that of a Benedictine monk. 10. You had to move dirty laundry/breakfast dishes off the table before you could start school. 11. The signatures on your diploma all end with the same last name. 13. 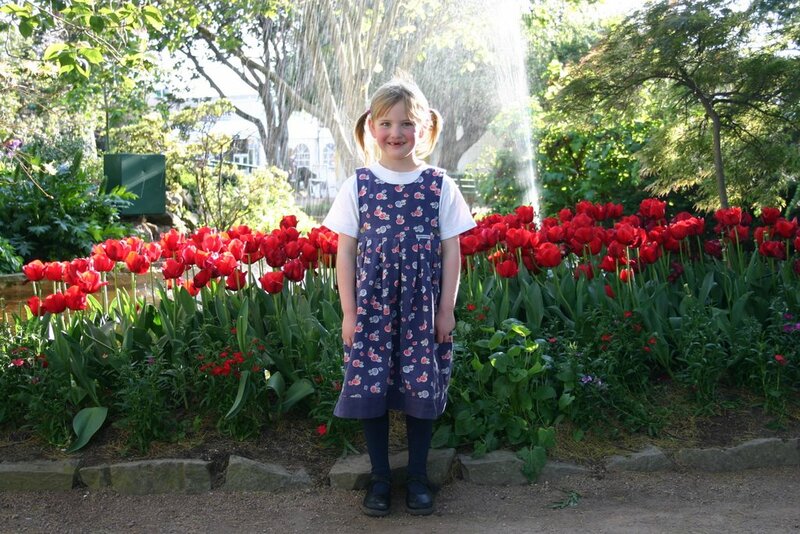 Your Mother’s wardrobe consisted primarily of denim pinafores/skirts (US:jumpers). 14. The word ‘homework’ sounded like a foreign language. 15. Your yearbook was also your babybook. 16. A snow day meant that you had to shovel the driveway after you finished your school work. Snow! That WOULD be a holiday! 17. You enjoyed the pastime of watching public school kids walk home from school. 18. You had to look at the clock to see if you could call your public school friends yet. 19. You thought that “public-school-kid” was an insult of the highest degree. 20. Health class consisted of eating breakfast. 21. You had to decide what year you wanted to graduate. 23. You can remember nearly every single day you went to public school. 24. The teacher could kiss the principal, and no one thought it was unusual. 25. You got to school and the teacher asked you if you’ve done all your chores/jobs. 27. Your school lunches didn't come out of a lunch box or bag. They came from the fridge, microwave or cupboard. 28. You’ve listened to Beethoven, ABBA, Cliff Richard, Il Divo and Rolf Harris on the same day. (And Weird Al Yankovic too) Not counting music lessons. 29. Gym class was actually a fun activity like swimming. 31. The closest thing to a bully in your school was your slightly strange two-year-old sister. Rose CAN be so pushy. 33. You heard the phrase “socialization” and laughed because you had more friends and knew more people than your public school friends. 51. Your home library is divided into several sections and bookshelves, probably a separate room. 54. When asked about what year you are in, you quickly make up a number to match your age. 55. You had no idea as to what rock bands were popular then…but you could recite all of the stages of cellular mitosis (in order). 57. Cleaning your room counted as Phys-Ed. 58. Your field trip took you overseas - for over 2 years! 59. Shop class included watching your grandfather rebuild his motor home and make swords. 60. Your track meet was riding into town to race bikes with a friend. 61. Your mum wished you’d stop reading and do something else for a change. 62. Your bedroom was your classroom and your bed or floor was the desk. 63. You stayed up till whenever, and not because you were doing homework. 64. You could get days ahead in almost any subject. 65. You recorded, planned and graded your own school work. 66. You forgot about the minor holidays until you saw your dad sitting home on a week day or your public school friends asked you over the weekend what you did on your day off. 67. You didn’t know what spring break was. 68. Your mom counted watching a war movie as history and playing out in the sandpit as PE. 69. You had more friends way older and way younger than you than ones your actual age. 70. You read for fun. 71. Dad takes you to work and doesn't need permission slips. 72. Your best friends tend to have the same last name. 73. Sleeeping in a room on your own is a punishment. 74. You plan vacations around school break - not during the break but after or before. 75. Your parent teacher meeting is held in bed just before you drop off to sleep. 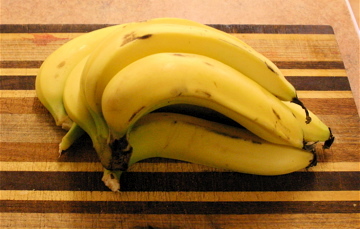 Bananas! They are almost a reasonable price at last. We gave the family a special treat yesterday by purchasing a bunch of 9 bananas for $10 ($7.50 US) This is a third of the price they got to at their peak and there were lots of "Mmmms" around as we savoured our first bananas in about nine months since Cyclone Larry devastated Australia's Banana crop back in March. In a few week's time the prices should be back to normal and we can look at buying them by the box again. Last time when I was returning home late, I stopped at McDonalds and purchased a quality meal. I noticed a competition being held with the prize of a "Springfree trampoline". "No springs?" I asked myself and examined the poster. I had no intention of buying any Happy Meals, but I did see a website address in Australia. 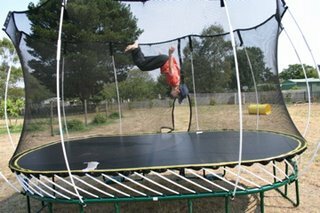 (www.springfreetrampoline.com.au) (the US site is www.springfreetrampolines.com) Considering Peters proclivity for jumping a lot, we investigated the website and were very happy with the safety features and design smarts. When we were in the US we had a trampoline with a net and wanted to get one here. 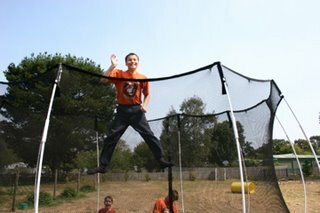 This trampoline is even better with no springs, no pads, and a much better net design. It also bounces higher and firmer. (Note how high Eric is. Ariel gets even higher.) In the top picture you can see that Peter has already checked out some of the capabilities. The trampoline came in three heavy boxes 8am on Saturday morning (when I normally get to sleep-in). I awoke groggy and signed for the boxes whilst Dad moved them to where we were to set up the trampoline. We then proceeded to assemble the thing. The process was pretty straight forward and the instructions were very detailed. There were no missing bits and a couple of useful spares were included. Fitting the rods into the mat was quite strenuous. Normally I awake at around 5:30 or 6:00am, have a shower, drive around two hours and then start work. Waking up and going straight into strenous activity made me realise how unfit I really am! 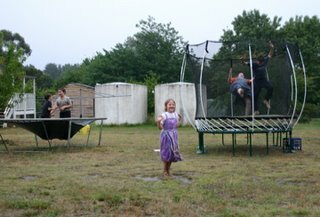 But the end result is pretty good and both trampolines are getting use. So now we have six Bruggies bouncing beautifully. Update: Oops. The Australian link was wrong. Now fixed. ALmost a year ago we posted our recipe for Unforgettable Fudge. This weekend Ariel made a batch (with some help from Lana) and I brought along a sample to the client Ariel has been assisting the last few weeks. Amidst the expressions of delight I was asked about the recipe. "It's on Bruggietales," I replied and then found that I had forgotten to include it in our recipe list! Oops. So, the "Unforgettable Fudge" was forgotten. But it is now remembered and placed in Lana's Recipes on the left. During the short time we were waiting at the Radiologist Office for our Ultrasound, the children filled half the waiting area and explored the treasure trove of new books to read. If an adult came in looking for a chair, one of the children arose from their chair and took a seat on the floor. I caught this photo of Ariel and the girls sharing some of the books. Eric had been sitting next to Clare, and when the lady in the white shirt came in, he stood up (unbidden) and offered her his chair. When our time was announced I quietly called to them all to come along and we proceeded to the tiny room for the ultrasound. Other than encoraging Peter to settle down during the boring time the radiologist was ignoring us doing his measurements, the children did pretty well. When we returned after an hour or so to pick up the results and accompanying report, we waited in the van while Lana went in. Lana took quite some time. When Lana returned about 20 minutes later we found out why. The ladies at the front desk asked Lana, "How did you get the kids to behave so well? I've got two and they wouldn't have done that." "It's a lot of work, and we homeschool." Lana replied. "I thought you did," said the younger lady, "When I saw how they were behaving I thought you must homeschool." 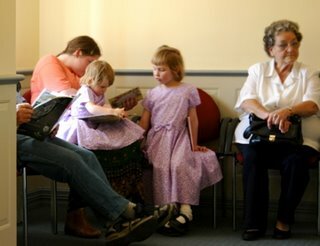 We earlier had a conversation in the waiting room with a lady and her daughter who was about to go into year 12. "I wish I homeschooled," sighed the girl. It's days like this we don't mind going out with the whole clan!